Mario Benedetti (1920-2009), Uruguay’s most beloved writer, was a man who loved to bend the rules. He gave his haikus as many syllables as fit his mood, and wrote a play divided into sections instead of acts. In his country, he was an outspoken supporter of the Frente Amplio, resisting the brutal dictatorship that forced him into a 12-year exile. He was a man who took sides, and took chances. That such a man could invent the intimate diary of a person like Martín Santomé says much for Benedetti’s deep sensitivity to the human condition. The diary is the text for his 1960 novel La Tregua (The Truce). A man of his times, Santomé is upset by his younger son’s homosexuality. He blames himself for Jaime’s “deviance,” and can’t understand why Blanca and Esteban turned out “normal.” But Martín Santomé continues to be the dutiful father, and we appreciate him for that, just as we forgive him for defining women by their body parts and believing that when they’re menstruating they can’t concentrate. Unlike certain contemporary homophobes and misogynists, he has no rancor toward gays and women, and is in fact a person who both tolerates and accepts differences so well that he welcomes a female colleague at work when she is one of three new employees assigned to his department. As with the male workers, he calls her by her family name, which happens to be the surname of the author who wrote a phony Part Two of Don Quixote (a book that made Cervantes very angry because in the counterfeit edition, Don Quixote falls out of love with Dulcinea). Benedetti, the consummate writer, must have seen something compelling there, because soon after Avellaneda comes to work for Santomé, he falls in love with her—with a love that is transformative and enduring. Martín Santomé had never imagined this romance. For a long time he’d been satisfied with anonymous one-night stands that had nothing in common with the sense of communion he’d felt with Isabel, his deceased wife. With her, he tells his diary, “every one of my impulses mathematically found its own receptive echo. We were made for each other.” The love for Avellaneda, a woman half his age, was a surprise that happened to him, not something he’d gone looking for. When the accountant first contemplates what it could be like with Avellaneda, what troubles him most is the mismatch between what he sees as her youthful expectations and his future of guaranteed arthritis—the portent of a relationship with barely a temporary patent. In ten years, when he’s pushing 60 and she is 33: will she cheat on him? Leave him for a younger man? As the affair progresses, though, Avellaneda declares her love, explaining to Martín that it’s not for his face, or his years, or his words, or his intentions that she loves him, but because he is a good man. His preoccupation now becomes her future happiness. He broods over whether there will be enough strength and longevity to give her a good life, a concern that becomes sadly ironic as the story unfolds. Harry Morales, the translator of this intriguing novel, does a fine job of giving Santomé a voice in English. Whether the accountant is speaking of the tedium and frustrations of office work, or the aging lover is fretting over physical and existential issues inherent in May-December romances, or the rejuvenated man is reflecting on his feelings for this “truce” that is occurring in his otherwise dreary life, the diarist’s entries—always a bit reserved—draw us in and make us a part of his world. Though Martín Santomé’s world is confined to the small middle-class society of Montevideo in mid-twentieth-century Uruguay, his issues with family, career, aging, retirement, and above all, love and loss, resonate beyond borders and time to make his diary a touching and rewarding universal read. 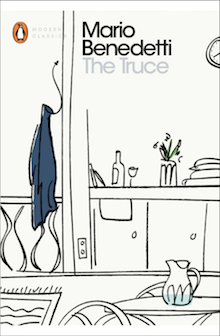 Of the ninety books Benedetti published, The Truce stands out for its popularity, with more than a million copies sold, translation into twenty languages, and a 1974 film version by Sergio Renán that was nominated for an Academy Award. In Martín Santomé’s simple urban life there is a depth and authenticity that people everywhere can identify with and appreciate, and now, with Harry Morales’s refreshing new translation, readers of English can enjoy this engaging novel by one of Latin America’s most acclaimed writers.